A clash has broken out between student protesters calling for safer roads and Awami League activists in Jigatala, near the party’s offices in Dhanmondi. The clashes began on Saturday afternoon. A group of men wearing motorcycle helmets—some of them armed—arrived later on the scene and clashed with the students. A bdnews24.com reporter saw two motorbikes going up in flames after an arson attack. Earlier, a confrontation took place between the students, who are holding citywide protests, and Awami League activists in front of the party president’s offices at Dhanmondi 3/A around 2pm. “The trouble started when a group of the protesting students went towards the party offices,” told a tea vendor. 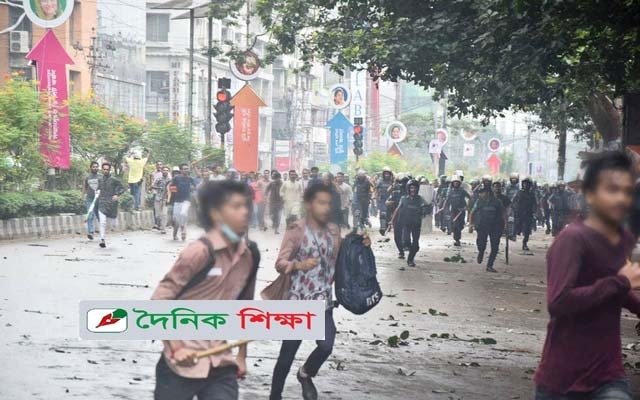 Witnesses said the students had begun moving in that direction after rumours spread that a protester had been held by Awami League activists. When the reporter arrived at the location, the students had retreated towards Shimanto Square. When they attempted to press forward they were again chased off by Awami League activists. The students then retreated to the Star Kebab restaurant on Dhanmondi-2. Around 5pm, a group of the helmeted men were seen throwing brickbats at the students who gathered by Star Kebab. The reporter saw one of them discharge a firearm. Some of the students were throwing brickbats at the attackers and had makeshift weapons in their hands.